Digital. It's both a dynamic and pervasive disruptor and the springboard to the future. Digital has changed the world as we know it, beginning with the consumer, then working its way to business operations and government administration. The way the world operates will never be the same. Big data and data analytics, robotics, process automation and enterprise information systems both disrupt traditional business and operating models and create such opportunities as process improvement, supply chain re-alignment and full-scale enterprise-wide transformation. We're at the juncture of digital, innovation and technology − the inflection point where companies need a wider range of new support, and EY is ready to help. Whether in the corporate context or for professional services providers, Tax has seen more change in the last five years than in the past fifty, with even more and even faster change on the way. We've built EY Digital Tax from strategy through services, from talent through technology. EY Digital Tax works in four quadrants that encompass the offerings designed to address the challenges of an increasingly digital working world — from interacting with digital tax administrations and e-governments to planning for tax effectiveness in a digital economy to levering technology to unlock value, manage risk, improve efficiency and provide value-add insights. At the center is the Digital Tax Strategy, which includes a holistic design session to help companies identify their immediate challenges — from taxation to operations — and develop an enhanced operating model strategy fit for the digital age, with a blueprint for easily integrating with the enterprise. To succeed in the digital world, seamless communication is a necessity, not a nice-to-have. Our holistic approach brings EY's Advisory, Assurance and TAS service lines and Tax sub-service lines together in collaborations — often unprecedented — that enhance our client service and help enable our clients to build and improve their own internal communications and collaborations. 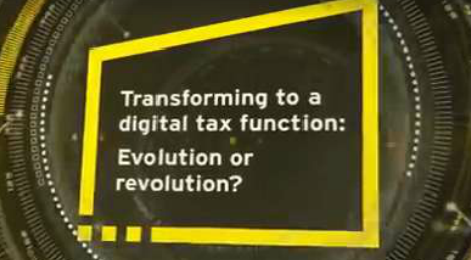 EY Digital Tax can help you keep pace with the digital revolution. Discover how. Click on the quadrants and center section to learn more. The EY Tax Executive Center provides the tools, training and insights to help inform your thinking, shape your tax agenda, strengthen your voice and enhance your value at the table. The rise of the new digital tax function: evolution or revolution? Change is a certainty, and it’s happening at exponentially faster speeds. What’s driving this transformation and disrupting the status quo? Digital.